A Little Piece Of Heaven In South West France! 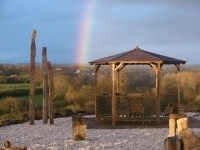 Boutique Spa B&B overlooking 25 acres of private land with stunning views. We specialize in your complete relaxation. On offer are an out door horizon-line hot tub; a range of massage treatments by a qualified & experienced therapist; gourmet vegetarian evening meals by a published cook (special diest easily catered for); a variety of craft courses & workshops; 25 acres of woodlands, river and meadows to roam in; pool table, darts and badminton. Accommodation is eclectic and varied ~ Studio Gite for 2 with shower/toilet, small kitchen and sofa bed; Ensuite room for 2 with bath/toilet and sofa bed; Bunk House dormitory which sleeps 8 with showers/toilets and summer kitchen; Tipi Lodge for 2. Can accommodate 14 in total. Old french stone buildings lovingly restored and decorated surrounding a large central courtyard overlooking the magnificent view. Knife Making and Digital Photography weekend workshops always available while other craft courses run throughout the summer. Massages available are the original LaStone Hot Stone massage; Shiatsu; Indian Head; Reiki.